Our detox programmes are all inclusive so you can relax and enjoy. Our unique DNE Protocol has been developed for optimum results and peak performance to ensure that you achieve great results. For specific details of the quantity of treatments included, please see our detoxes. Please note that our new cookery retreat and dinner party programmes do not include treatments, however they are available to book in addition. At the beginning and the end of your Milestone Detox we will record your weight and measurements and do a pH test. By mindfully nutrifying your body and soul, you will detoxify your system to look and feel great. Bad stress and processed foods contribute to a pH imbalance in your body. Natural, raw and organic foods bring your system into optimum balance. We will teach you how to keep your pH levels healthy. 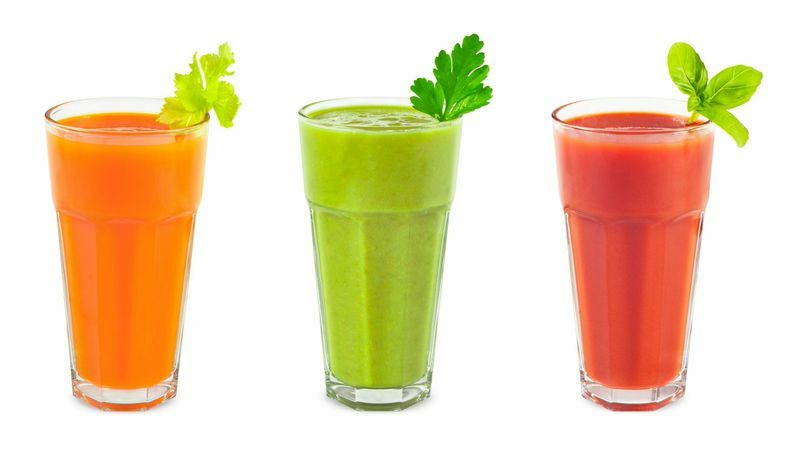 We prepare fresh, organic juices made from locally sourced organic vegetables and fruit using a slow cold press process that retains the natural enzyme life and vitality of the ingredients. Daily supplements include aloe, vitamins, digestive enzymes, probiotics and herbal laxatives. We also provide neutral-tasting bentonite clay and psyllium husk shakes to help cleanse the body as well as to help fill the tummy and avoid hunger pains! Before bed we will serve you some yummy vegetable broth which is a great way to end each day. Liz is our qualified Colonic Hydrotherapy Practitioner and a member of both the Association of Registered Colonic Hydrotherapists (ARCH) and Complementary & Natural Healthcare Council (CNHC). She has over 15 years experience as a colonic practitioner and a further 20 years experience in nursing and midwifery. Enjoy our full spectrum infrared sauna to maximise your detox experience. You can burn up to 600 calories in one hour and it’s a total detox! We researched the global market and have sourced the best available product for your detox experience. Infrared saunas do not heat up the air so its comfortable to breathe. Infrared heat penetrates deep into your tissues meaning it’s 600% more effective than a steam sauna for detoxification, the toxin content in traditional saunas is 3% with our full spectrum infrared sauna the toxin content is 18-20%. The model we have chosen also has zero EMF radiation unlike most others on the market today meaning that there are no adverse EMF effects (most electronic devices emit harmful EMFs). Find out here why the combination of lymphatic drainage and full spectrum infrared sauna is so powerful for a thorough detoxification experience. Though lymph vessels are found throughout the body, most of them–about 70 percent–are located just below the skin. These fragile vessels work to pick up fluids between the cell spaces when gentle pressure is applied to them from increased fluid build-up, muscle contractions, or the pressure of a therapist’s hands. By using very light pressures in a rhythmic, circular motion, our massage therapist can stimulate your lymph system to work more efficiently and help it move the lymph fluids back to the heart. This is a very relaxing treatment you are sure to enjoy. We offer pulsed electromagnetic therapy (PEMF) on the very best in class device made in Germany. Used by NASA and in many of the leading health clinics around the world. The mental focus and controlled breathing required to perform Pilates correctly helps reduce stress. The exercises also help regulate your sleep and improve your mood. Pilates may help reduce symptoms such as fatigue associated with a variety of disorders including cancer, depression and chronic pain. Practicing Pilates can help improve flexibility, range of motion, balance and posture. Pilates strengthens and tones muscles without adding bulk, making it an exercise of choice among dancers and other athletes. Pilates strengthens the core and back muscles and may help manage back pain it can also reduce your heart rate and blood pressure. Pilates is not an aerobic workout, so we supplement them with cardiovascular exercise which includes rebounding, circuit training and cross-country walking. We have an excellent personal training gym only 5 minutes away. The personal trainer will provide a complete cardio, core and resistance circuit workout tailored for the group. Perfect for toning up the new you! Our clients absolutely love walking through the stunning Cotswold countryside. Fresh air, beautiful scenery, and great company - even the family dog, Patch, joins in the fun! We were made to walk and it is the most natural form of exercise. Jonathan who often leads the walks, makes them not only physically enjoyable, but interesting too as he shares his knowledge of local heritage and folklore. The practice of earthing basically involves coupling your body to the Earth’s surface energy by walking, sitting or sleeping outside in direct contact with the Earth or using a device, such as a grounding mat or bed sheet that creates the same response while indoors. When in direct contact with the Earth, your body becomes suffused with negative charged free electrons and equalises to the same electric energy level as the earth. This thermographic image was taken of a woman who complained of stiffness and chronic pain. The first picture was taken before earthing, and the second, after just 30 minutes of earthing. The possibility of grounding or earthing resolving inflammation is exciting, as many chronic diseases cause and stem from inflammation in the body. Either way there is nothing to lose by trying earthing, and the book 'Earthing: The Most Important Health Discovery Ever' is filled with first hand stories of those who have benefited, as well as research and information from doctors, a cardiologist and an electrical engineer. Bouncing benefits the lymphatic system, commonly summarised as the “garbage disposal of the body,” relies completely on our conscious movement. Unlike the cardiovascular system with the heart automatically pumping fluid, the lymph system relies on our body movements as a pump. This is why rebounding is so great – every cell is compressed, released and activated with each bounce. 100 pounds overweight, loaded up on steroids and suffering from a debilitating autoimmune disease, Joe Cross is at the end of his rope and the end of his hope. In the mirror he saw a 310lb man whose gut was bigger than a beach ball and a path laid out before him that wouldn’t end well— with one foot already in the grave, the other wasn’t far behind. FAT, SICK & NEARLY DEAD is an inspiring film that chronicles Joe’s personal mission to regain his health. With doctors and conventional medicines unable to help long- term, Joe turns to the only option left, the body’s ability to heal itself. He trades in the junk food and hits the road with juicer and generator in tow, vowing only to drink fresh fruit and vegetable juice for the next 60 days. Across 3,000 miles Joe has one goal in mind: To get off his pills and achieve a balanced lifestyle. “Let Thy Food Be Thy Medicine, And Thy Medicine Be Thy Food.” – Hippocrates That is the message from the founding father of modern medicine echoed in this brave new documentary film brought to you by Producer-Directors James Colquhoun and Laurentine ten Bosch. ‘Food Matters’ is a hard hitting, fast paced look at our current state of health. Despite the billions of dollars of funding and research into new so-called cures we continue to suffer from a raft of chronic ills and every day maladies. Patching up an over-toxic and over-indulgent population with a host of toxic therapies and nutrient sparse foods is definitely not helping the situation. In a personal quest of discovery James & Laurentine together with a film crew and the editorial and production expertise of Enzo Tedeschi have set out on an independent mission to uncover the wholesome truth. There's no better way to unwind in an evening than with a session of gentle stretching and guided breathing. The body heals itself best when in the state of relaxation, or in the parasympathetic part of the nervous system. The body loves to relax when fully immersed in warmth and fragrant moisture. We provide all the necessary ingredients for our clients to enjoy a leisurely detox bath each day, designed for both transdermal nourishment as well as detoxification. Essential oils can be used for a wide range of emotional and physical wellness applications. They can be used as single essential oils or in complex essential oil blends depending on user experience and desired benefit. Clients can choose which oils they feel will benefit them most in our hands-on aromatherapy workshop using dōTerra oils. Naturally occurring, volatile aromatic compounds are found in the seeds, bark, stems, roots, flowers, and other parts of plants. They can be both beautifully and powerfully fragrant. Essential oils give plants their distinctive smells, essential oils protect plants and play a role in plant pollination. In addition to their intrinsic benefits to plants and their beautiful fragrance, essential oils have long been used for food preparation, beauty treatment, and health-care practices. Helena is here with the a collection of dried plants and seeds in the Hippocrates Foundation on the island of Kos, Greece, where the Father of Medicine, Hippocrates, wrote extensively about the benefits and applications of aromatic compounds. Our Anti-Cellulite Body Wrap can help improve the appearance of cellulite, characterised by dimpled, lumpy skin, which appears to have areas of underlying fat deposits most noticeable on the thighs and bottom. Originating from a professional salon treatment, this kit contains all clients need to actively tighten and tone less than super smooth thighs and bottoms, without the use of harsh chemicals. We show clients how it's done and then it can be used as often as required, until the desired results are achieved. With an incredible 50% reduction in cellulite from first time use, and many clients achieving actual inch loss used in combination with the Full Spectrum Infrared Sauna, this is a very effective treatment.